Cannes Lions Health 2014 festival was supposed to be the world’s first contest of creativity in healthcare and pharma advertising. Made by advertising agencies and for advertising agencies, Lions Health could not find a grand prix winner in Cannes this year. Does it prove lack of creativity, or rather that the whole concept of advertising in the healthcare industry is wrong? No grand prix of Cannes Lions Health 2014 was awarded. A Jury made only from the advertising agencies, focus on vague “creativity” and not measurable effects or validity of choice. From K-message perspective it is all failed, with the only exception of a Grand Prix for Good award given to Colombian League Against Cancer for its Cancer Tweets campaign. A cancer that follows you virtually. Cancer is a silent disease, every year millions of people die for ignoring their symptoms. That’s why we created Cancertweets, an act that make people feel what it is like to have cancer and how easy is to ignore it. We created 7 Twitter accounts that represented 7 types of cancer and ‘spread out’ the virtual cancer throughout thousands of accounts. Virtual cancer acted as a real cancer: at first, followed silently. Then, started to manifest subtle; finally expressed its symptoms directly. Those who detected on time, virtual cancer stopped following them. Those who ignored it, received a final message. From our perspective it is not about “setting the bar” too high. Pharma marketing is just different. We talk about serious issues, we should base our communication on scientifically proven statements. The idea of “promoting” a pharmaceutical product to patients is from the very beginning dangerous and thus forbidden in most of the world. For the healthcare professionals, we should bear in mind that any additional noise may adversely impact their decisions and, in effect, patients well-being. Human brain while making decision can process 5 to 6 factors. In medicine there are usually hundreds of factors to be taken into account. Do we really need to produce more of it? Or shall we rather focus on making the process easier to congest, by making tools for better processing the scientific information about our products and diseases to be treated? . 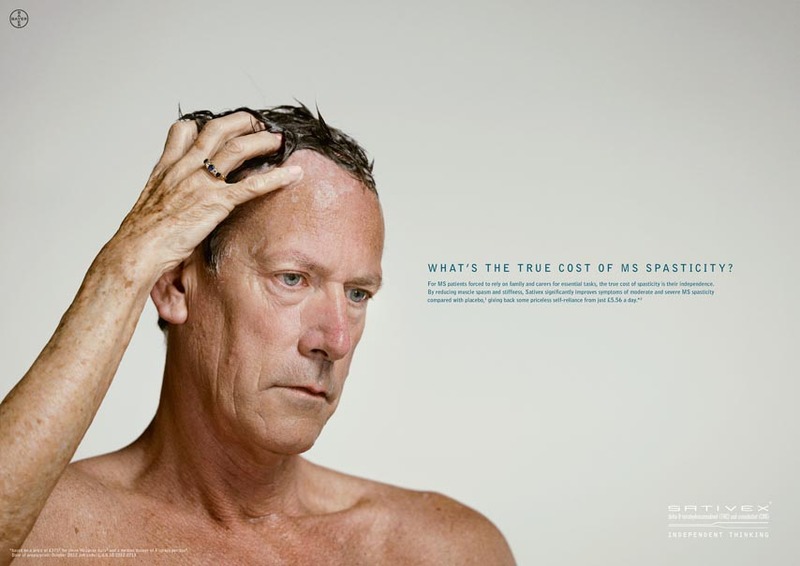 Saying that, feel free to take a look at the Cannes Lions Health 2014 Gold Lions awarded campaigns. While they are not worth a Grand Prix, they are well executed. Our pick from those three would be Mind Your Meds. It puts digital tactics at the core, provides not only emotional message but also valuable information. Spasticity is a symptom that develops late in the course of multiple sclerosis (MS), causing muscle spasm, weakness and stiffness. Patients lose their independence and are forced to rely on family members and carers to accomplish basic tasks. The limited treatment options have significant side effects, or require an implanted pump. Sativex is a novel treatment developed from particular strains of cannabis that significantly improves symptoms of spasticity in responders. Because it is delivered as an oral spray, patients can adjust their dose as and when they need to. However, HCPs have been equivocal about its value, and concerned about its cost. To drive re-appraisal of the brand among prescribers, we used the unifying idea of ‘cost’ to bring together the effect of MS spasticity on patients with its broader social impact and the financial realities, increasing their motivation to gain budget approval for Sativex. Teen medicine abuse is a pervasive and devastating problem, with one in four teens admitting to using a prescription drug to get high or change their mood. Most teens who report medicine abuse say they get those medications from their family or friends. The Medicine Abuse Project is a multi-year effort led by The Partnership at Drugfree.org and is designed to help combat this public health crisis deemed an “epidemic” by the Centers for Disease Control and Prevention. The Medicine Abuse Project aims to help educate parents, teens and the public about the dangers of medicine abuse and unite parents, educators, health care providers, coaches, government officials, law enforcement officers and other partners to help save lives. Click for the full list of Cannes Lions Health contenders and awards in Pharma category.